Meetings are something that all managers and leaders need to be able to plan, organize, run and follow up on. When I was a project engineer, I had to run lots of meetings and had training in effective meetings at a couple different companies. I've attended good meetings, and really bad meetings. In education, many meetings seem to be a complete waste of time, or the entire faculty is at a meeting that only affects a small number. Meetings are expensive - you have to take into consideration the time and salaries during the meeting and the fact that people aren't doing other work. 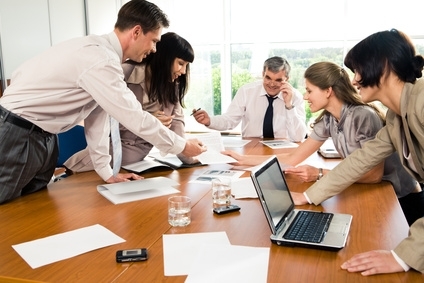 Make your meetings effective - have a clear objective and keep them short and to the point. 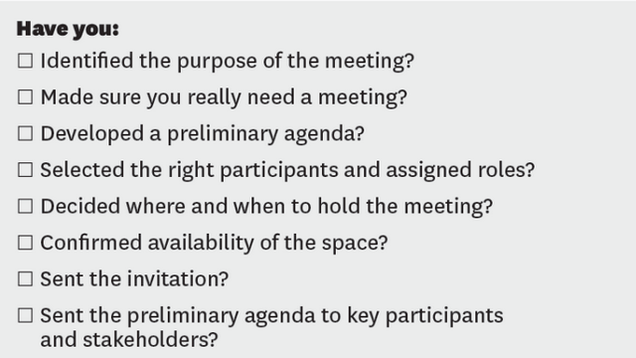 These key points are great for anyone running a meeting. 1. Define purposes of meeting - why are you meeting? What is the objective of the meeting? Also, does this meeting have to be face-to-face, or can it be virtual, via email, Google Docs, etc. Do we need to meet as a group or could certain people deal with issues? 2. Develop agenda - what are the key points that need to be addressed. Who needs to be at the meeting? What tasks need to be assigned during the meeting? What is the time frame for the meeting? 3. Distribute agenda prior to meeting - this gives attendees a chance to prepare any materials or information prior to the meeting and to be prepared. This also keeps meetings moving faster. The agenda can be emailed, shared as a Google Doc, or posted online. 4. Arrive and start on time - the person running the meeting should be there early and ready to go. Have extra copies of agenda available. Start on time and stick to the schedule. 5. One speaker at a time - follow rules. One person talks at a time, no side conversations. 6. Review agenda and set priorities - what is the top priority to be addressed at the meeting? What needs to be accomplished? 7. Stick to agenda - items not on the agenda should be held to the end or put off to a later meeting. 8. Assign task responsibilities - make sure people know what they are responsible for and where to go for support. Give them resources and help to accomplish their tasks. 9. Establish target dates - when do things need to be done by? When is the next meeting? When will follow ups be done? 10. Summarize agreements - summarize what was accomplished, decided, and agreed upon. 11. Close at or before agreed time - do not run over unless absolutely necessary. Things can be discussed online or at a later meeting. 12. Keep a written record of meeting - assign a secretary and keep notes of the meeting including attendees, agenda, what was discussed, tasks assignments, and follow up information. 13. Edit and distribute minutes promptly - minutes should be distributed within 24-48 hours of a meeting. 14. Encourage completion of tasks - remind persons of task assignments and due dates and offer them help and support. 15. Put unfinished business on agenda for next meeting. - Unfinished business should be addressed at the beginning of next meeting. Meetings should not be something people dread attending. They should be where things get discussed, accomplished, and decided. Follow these key points and your meetings will be more effective.